A subliminal message is any piece of information which we receive without us consciously perceiving it. This information can come in any format; from video, to images, and of course, subliminal audio. Subliminal audio is our speciality, so rather than explaining the science of flashing images we will keep things related to subliminal audio. You can make an audio message subliminal in a few different ways, but the technique we use is simply to record a set of verbal suggestions and move them to a higher sound frequency. This means that the verbal commands will be just out of range of your regular, CONSCIOUS hearing limit. The key to subliminal messaging is that you do not consciously hear the statement, but your subconscious mind is capable of picking it up, and storing it in your mind as normal. Your mind is like an iceberg - your conscious mind is the 10% on the surface, but the more powerful, larger area of the mind is the subconscious part, and it is capable of picking up information you are not always consciously aware of. It takes in this subliminal information and stores it within your mind, and with enough exposure you can make changes to your belief systems, ways of thinking, habits, and much more. You might be thinking "what's the point in subliminals?" or "why bother making the messages inaudible?". Well, this is because a regular statement and a subliminal suggestion have different effects on your mind. If, for example, you repeat affirmations to yourself or use an album with audible suggestions then you may be so set in your ways that your conscious mind will reject the suggestions. For example, if you have self esteem issues and someone tells you "you are confident" this will probably get instantly dismissed as your conscious mind "knows" the statement to be false. However with subconscious programming the barrier of your conscious mind is bypassed and it is therefore possible to make changes which you would not be able to if the information was sent via regular regular conscious development / learning methods. Everyone is different - some people experience the effects of subliminal messages almost straight away; feelings of being energized, focused, clear in mind, or highly motivated are common. For others the changes take a little while to take effect, but over a longer duration you should notice a change in your attitude, and you will probably notice you have different thoughts and beliefs concerning the change you are pursuing - this will then start to filter into your everyday actions and change your patterns of behavior on a bigger scale. How you listen is a personal preference. There is no single best way to listen. What works for you might not be right for someone else. If you are serious about making a change in your life then try and create a "total immersion", i.e. play your albums whenever, and wherever you can. You can listen while you sit and relax, or while you work, while you study, while you read, exercise..and yes you can listen in your sleep too. You should use these albums as much as possible, and listen anywhere that you either have access to a computer, or are able to use your Mp3 Player. This total immersion in subliminal audio, when combined with planning and conscious action towards your goals will make you much more successful - it will make sure you are ALWAYS focused on reaching your goal. It will ignite a burning desire to succeed; giving you a massive advantage towards anything you pursue in life. Can I listen to several albums at once? Yes you can, but it is really just personal preference. Some people prefer to listen to one album at a time, others often have multiple albums playing at the same time. This can really help expose you to a lot of positive subliminal messages, but it is not right for everybody. Each person is different, and we recommend experimenting to find the right balance of albums for you, and seeing what brings you the best results personally. Can I listen too much? Simply put, no :) You will never have a negative reaction to using our subliminal albums. You can listen as much as you want. In-fact we RECOMMEND listening whenever you can. If you play your albums frequently you will create a "total immersion". You will be super focused on your goal, more motivated and driven, and you will really go all out to make it happen. Everyone is different. As a general guide you should see some change within a couple of weeks, and then see the results to build further. Yes it is 100% safe. You will never experience any negative effects from our albums. You can read the exact script for each album on each album page. We only use positive affirmations and you still actually retain control. If you want to change, if you want the album to work then your mind will accept the messages and it will help you. If you resist it then you will likely not get much benefit. Although our albums will not put you into a trance, please do not listen while driving or operating machinery. The background sounds themselves can be quite relaxing. We also use some suggestions to help you to relax, and to let go of your stress and tensions etc - so please do not use them while you are driving. Can I listen in my sleep? Yes - many of our users do. It is completely safe, and we have heard some excellent results from people - as well as using this method of listening ourselves. When you are asleep your "guard" is down and it can be an excellent time to send subliminal information into your mind. Every album is different. Some albums are designed to be used on an ongoing basis - to give you a boost there and then. However, yes, many of our albums will bring about a permanent change in your mind. You are essentially changing your belief systems about yourself and your thought processes, and once you have changed them then yes, the results will last. You can try 3 of our albums for FREE. Simply join our newsletter and you will receive our subliminal e-course with a free album each week for 3 weeks. This will let you try subliminal messaging for yourself and give you some advice on how to use the albums and what to expect. With any other albums that you download from us you are covered by our 60 day guarantee. We want our albums to work for you, and if they don't we don't want your money. Simply contact us and quote your order number and we will process your refund, no questions asked. What makes your albums different? Is this really needed? Probably not. Does using a "million" different affirmations make the product better? Well it might sound impressive, but we don't think this is necessary. In our opinion this is just another example of large corporate companies using technical jargon to sell their product, and justify their prices. We take a simpler approach - we record the script of affirmations to one layer at a higher sound frequency. This is something we know has worked for us, for our friends and family, and already for thousands of people using our site. Why are your albums cheaper than other sites? We operate on good nature - we do not want to overcharge anyone. Subliminalmp3s.com was never made to "make us rich", but we do need to charge a small amount for our albums so we can keep growing - adding new features, and new albums, and to make the site even better for you. Yes, any album you download is covered by our 60 day money back guarantee. Why does every album sound the same? All of our albums sound the same on the surface. They all use the same 5 tracks, so everything you will consciously hear on each album will be the same. However, our albums are a "pure subliminal" product. Every album is different as it contains different subliminal positive affirmations. You can read the script for each album on the related product description page, and these affirmations are different on every album - so although they sound the same on the surface, in the background there is a different set of positive affirmations used on each album. What is the difference between the 5 tracks? There are 5 tracks to every album; Ocean, Rainfall, Fire, and Wind, and Silent. These 5 tracks each contain the same affirmations (which you can see on each product page) - we include 5 different tracks purely to give a variety of sounds for you to choose from if you prefer one type over another. How long does each track last? Each track is approximately 12 minutes long. How does the silent track work? Our silent track works in exactly the same way as our 4 regular tracks - but of course you won't hear a thing. This option allows you to receive subliminal messages in complete privacy - no one will ever know what you are listening to if you are interrupted. It also means you can play them anywhere, anytime without any distraction at all. This is a popular option for people who listen on the move, or play the album at their desks while working for extended periods, or even play the album on loop all night when they sleep. The silent track can help you gain a greater level of immersion in your subliminal messages and therefore help you advance towards your goal quicker. Do you publish the scripts? Yes, you can read the script for each album on each specific album page. How do you write your affirmations? We write the affirmations in the present tense wherever possible - i.e. the affirmation suggests that you have already achieved the result you want. This method of writing is preferred as it tricks your mind into thinking it has already happened and into experiencing the feelings associated with the change. This makes it easier to reach your goal, because in your mind you have already experienced it. As the messages build within your mind you start to really believe them and once you do, your actual behaviour soon catches up. Sometimes it is not possible to write multiple different statements in the present tense so we do use some future tense statements - i.e. statements which motivate you to make a change in your life. You can see the affirmations we use on each specific album page to make sure they are a good fit for you. No. Headphones are not required. Your mind will receive the messages through regular speakers - headphones are purely optional. Yes. All of our albums are recorded in English only. You can see the script on each product page, and if you can understand the statements then you will experience a benefit. Sorry, but we do not have the knowledge to be able to produce albums in other languages. Immediately after your payment is completed you will be taken directly to the download page for your album. You can download the tracks individually as you wish and be listening within just a couple of minutes. You should have received an automatic email with your download link straight after your purchase (please check your spam / junk folder if you can't see this). If you still can't find your download link you can recover this with your clickbank order number. This will be listed on either your Credit Card statement, or your PayPal transaction statement, depending on how you paid. Once you have this go to our order recovery page and enter your order number to get access to your download page again. If you still can't find your order number then please contact us and we will locate your order. Can I get the album in audio CD format? Sorry, we only offer mp3s, and have no plans to offer CDs for sale. Can I burn a CD from the Mp3s? How do I move the tracks onto my iPod / Mp3 player? We admire your thirst for knowledge, but we receive 100s of questions every day. We just don't have the time to answer everybody. From our experience, if you still have questions after reading this entire FAQ then they will probably be personal questions about if an album can help you, or more in depth questions on how is best to listen. The best advice we can give you is to join our newsletter and experience subliminal messaging for yourself. You will receive 3 FREE albums over a period of 3 weeks which will introduce you to subliminal messaging and show you how to use the albums. 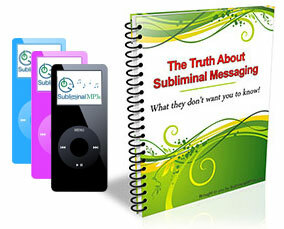 Subliminal messaging is a very personal thing; everyone experiences it differently, and even uses the albums differently. Our albums will never do you any harm, so experiment today, and FIND OUT what the best method of listening and using the albums is FOR YOU. Some people listen to multiple albums at once, some people play one album all day and all night, others only have the time to listen for a few minutes a day. As long as you have some time to listen you will receive the benefit - the rest is personal preference, and finding the right solution for you. We do provide technical support for our premium download customers - please visit our contact us page if you are having any problem with your download.